I didn’t plan to fall in love this way. I was actually hoping for Bjork to fall in love with this homemade blueberry sauce as it dripped off of a stack of Sunday morning Swedish pancakes. But I fell for my own trick, and now my lips are stained purple and I can’t stop drowning foods in blueberry sauce. As you maybe noticed from the list of top ten friends for homemade blueberry sauce, I’ve gotten really creative in the last 24 hours. Chances are good that I’m going to turn into a Willy Wonka blueberry any minute now. It was all worth it. This easy blueberry sauce is made with fresh blueberries, sugar, vanilla, and corn starch. Thick, sweet, and perfect for topping pancakes. Place 1 1/2 cups blueberries in a small saucepan. Cover with water and add sugar and vanilla. Heat over medium-high heat until mixture comes to a low boil and blueberries just start to break apart. Add dissolved cornstarch to saucepan and bring mixture to a rolling boil. Turn heat down and simmer on low heat for 2-3 minutes, or until sauce reaches desired consistency. Add water, one tablespoon at a time, if the sauce gets too thick. Remove from heat. Add remaining blueberries and stir gently. Serve warm or cold. So obviously you’re having brinner for dinner tonight. Because you’re awesome. And I’m having brinner all week. Because I’m obsessed. This looks amazing! My son LOVES blueberries so he will enjoy this. I like to buy frozen organic blueberries because they’re a little cheaper than fresh ones so it’s good to see you can use frozen blueberries too. Same. I am so cheap when it comes to fresh berries. Frozen is a perfect solution! Damn…that looks awesome!! I love how thick it is!! This looks so delicious! I just picked up some organic frozen blueberries on sale two days ago…definitely going to use them for this! Perfect! That’s exactly what I used, too (organic frozen). That blueberry sauce looks so gloriously glazed and chunky. But to tell you the truth, I’m crushing on the edges of those Swedish pancakes! Yum! This is exactly how my dad makes his blueberry syrup. 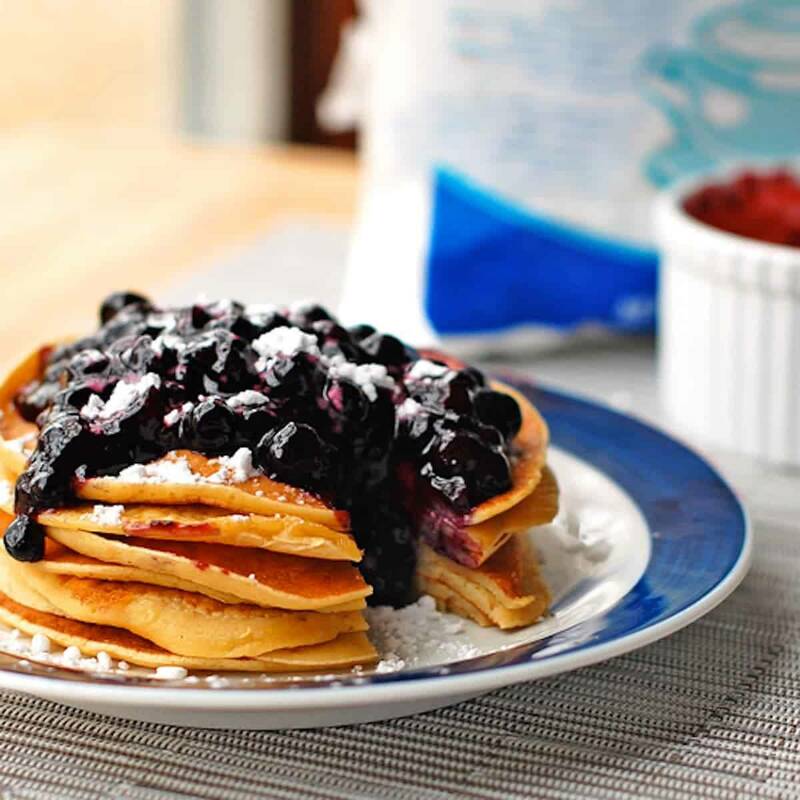 We usually top our blueberry pancakes with blueberry syrup and it is soooo good! You are totally a brinner enabler right now. But ohhhh man this looks so yummy!! Hmmmm, I need to start making pancakes. Just for this sauce. You need to start immediately. Ooh beautiful! I love your list of ideas of what to put it with. Sometimes I wonder, very helpful! Is it acceptable to just eat it from the bowl…? Hello, do you even know me? Of course it’s acceptable. LOVE blueberries so much! This looks amazingly yummy! Confession: I don’t even love blueberries so much but somehow I do love this sauce! A lot! That just looks so fantastic. Your picture if awesome! Come visit us. We have a terrific mulled cider recipe today. I love that you made Swedish pancakes. I swear it’s a MN thing…or maybe rural east central MN thing. 🙂 Looks so good! Um, just realized that I actually said that they were Swedish pancakes in the post. But still. I made almost an identical blueberry recipe for pancakes a couple weeks ago that I still have yet to post!!! We must be on the same wavelength – yours looks GORGEOUS! It’s also good with cake 🙂 that’s ok for breakfast too right? MMm with cake! Love that idea. I’m thinking this would be awesome on my cheesecake and topped with homemade whipped cream! ummm yes please! this would so be so awesome with blueberry pancakes! i can’t even imagine. The pancake recipe is on the queue for another day. 🙂 It deserves a day all its own. Oh my, I just want that in front of me RIGHT NOW! Looks incredible!! Me, too actually! 4:30pm is close enough to dinner time, right? We’ve put the rest in a big jar for later – with a fancy ribbon, something like would make a great present! You’re right! 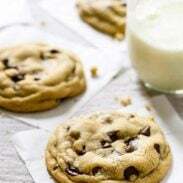 Simple, quick, homemade and YUM!